All Green Valley homes currently listed for sale in Green Valley as of 04/25/2019 are shown below. You can change the search criteria at any time by pressing the 'Change Search' button below. If you have any questions or you would like more information about any Green Valley homes for sale or other Green Valley real estate, please contact us and one of our knowledgeable Green Valley REALTORS® would be pleased to assist you. "PANORAMIC VIEWS!! HORSE PROPERTY!! Are you looking for peace, tranquility and serenity? 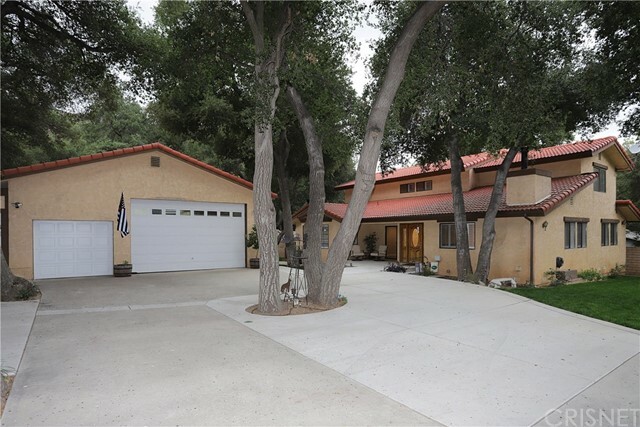 Come see our majestic one of a kind craftsman ranch set on almost 10 acres in Santa Clarita Valley. This custom home was built from the land with construction materials used from the ranch itself. The home sits on top of its own mountain with amazing views of the valley that can be enjoyed from the wrap around porch and balcony. This home features 6 oversized bedrooms, 5.5 baths, and 5212sq.ft. of living space. Various structures that could be used as guest houses, stables, corral, equestrian ring, storage sheds and out buildings. 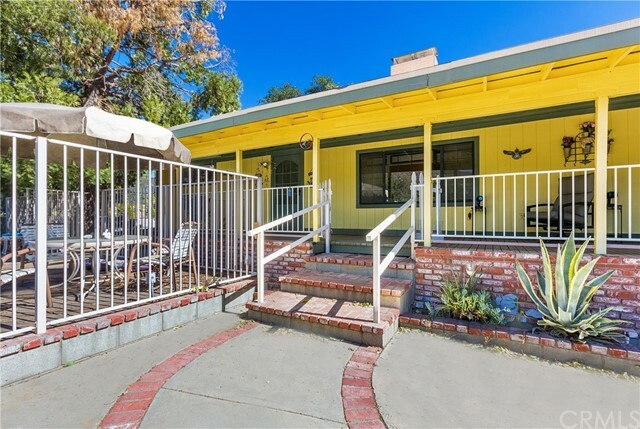 Entertainer's property includes above ground spa, built in BBQ, garden area, covered patio, vegetable garden, kids play area, pigion/chicken coup. The home is built like a luxury resort, with a grand room, including private bar, beautiful fireplace, built in table for 10 and a chefs kitchen with designer appliances including double ovens and a 6 burner stove. There is a large sunken living room with huge fireplace, a formal dining area, full bedroom with attached bath and oversized laundry with chute. The master suite is like a cabin spa, with soaring ceilings, wrap around balcony, amazing master bath, sitting area, private fireplace, and walk in closet. There are 4 more bedrooms with attached baths on this floor and a ginormous loft. Leave all your troubles behind and come enjoy the peace and serenity offered by this magnificent ranch." "Spectacular Estate offers the ultimate in indoor/outdoor living! The 1.4 acre grounds are beautifully landscaped to perfection w/a wonderful large covered patio area, built in gourmet kitchen, fire pit & masterful hardscape. Multiple sitting areas & numerous inviting walkways, a large variety of trees & gardens, RV parking & incredible million dollar views! YOU REALLY HAVE TO SEE TO APPRECIATE ALL THIS HOME HAS TO OFFER! The highlight of the main house is the spacious family room that boasts a stunning stone fireplace, wood beamed ceilings, two sets of double french doors & skylights. The additional 500 sq ft attached garage has been converted into an absolutely amazing game room that opens up on both sides to enhance the indoor/outdoor living; giving the home a total of over 2300 sq ft. Thousands spent on high tech sound system, light system, 36 zone sprinklers & sophisticated drain & pump system. And that's not all! Another meticulously structured 750 sq foot building can be utilized as a workshop, gym, garage or flex room of your choosing. There is also a 2 car carport. All this nestled in the Sierra Pelona Mountains, backing to a national forest. Wonderful private retreat suitable for so many different options; celebrity retreat, AirBnB, pro sports player get a way, family home. Built in 1990 with thousands spent over the years creating the most tantalizing, peaceful and exceptional outdoor living spaces, done with precision and care to preserve the home and grounds." "Gorgeous and move-in ready, this one has it all bundled into one property, located in scenic Green Valley on 1/3 acre fully fenced with a renovated 3,209 square foot home, plus a large 1,380 square foot detached 3-car garage & workshop, set up for maid's quarters with bathroom & laundry & 220V, plus a 24' x 36' RV cover, & 11' x 33' Boat parking. The formal living room has recessed lighting, plantation shutters, & a floor-to-ceiling flat-stone hearth & thermostat-controlled pellet stove. Attached to the living room is a spacious bonus/entertainment room which could be converted into a 4th bedroom with a dividing wall. Along the spacious hallway there s a wet-bar room to the left before entering the huge newly renovated kitchen with granite counter-tops & center island & breakfast bar, new stainless steel appliances, under-counter lighting, large pantry, & beautiful tile floor, plus a pellet stove in the corner. Enjoy two master suites, one upstairs with its own fireplace & balcony, and one downstairs, with large full bathrooms & separate tub & shower. An additional large bedroom upstairs & loft area, and a downstairs guest bathroom, plus a private deck attached to the kitchen. Lots of concrete throughout the property for ease of parking all the big toys! The front electric wrought iron & block gate is 28 feet long and lighted, with motion sensor lights on property. Several majestic Oak Trees provide privacy, beauty & shade, along with detailed landscaping throughout." "WOW this is the one! Unique Green Valley property is perfect for your multi-generational family or maybe you want to live in one and rent out the other! 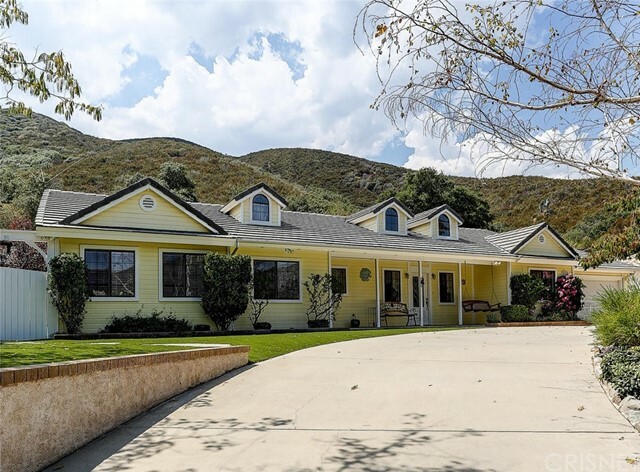 Located on 3 parcels of land totaling 30,555 square feet with RV parking (water & electrical) and beautiful mountain views, this spacious 2-story home is ready to move into. The first level has a large living room with fireplace and French doors that open to the deck. In the kitchen, you have tiled counter tops and ample prep space. This level has 1 bedroom and 1 bathroom plus a hobby room that could easily work as your home office. The laundry room has a steam cleaner. The second level features a formal entryway, living room with a fireplace, hardwood flooring in the dining room, and a parlor room that offers a wet bar and refrigerator. This level has 3 bedrooms and 1 bathroom. 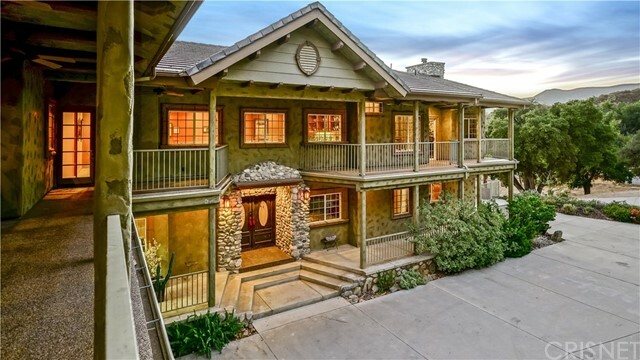 Enjoy extensive crown moulding, recessed lighting, smooth ceiling texture and mountain views from several newer dual pane windows on both levels. This home has central air conditioning and heat. There is a detached garage with workshop. Plenty of outdoor entertainment space on the top level covered deck, lower level covered patio, spacious wood deck and expansive grounds. Hang your hammock between two shade trees and enjoy much needed relaxation away from city life, only 20 minutes from Santa Clarita and Antelope Valley. Properties this special come around rarely, so take a closer look in person and see if you love it too!"